This is an adorable little bakery out in the northwest of the valley, N95 & Durango to be exact. You could stop here on your way to Mount Charleston because you have to drive right past the exit, and you would enjoy every minute of it. It is locally owned and operated by a husband & wife team, which I love because in my experience when you are at a small business like this you get an extra level of customer service than if you are at a chain. They care more about the people that walk through their doors and it really shows. They are taking a summer break where they will be closed June 24th – 29th just to give you a heads up if you want to give them a try soon. They serve a broad selection of cupcakes each day as well as flavors that run just for a limited time or on specific days only. You can go here to check out their menu directly on their website. They also have a selection of daily cookies that seem to change up to match their client’s wants. They can also do custom cake orders with advanced notice you can check out their facebook page for photos of their work here. 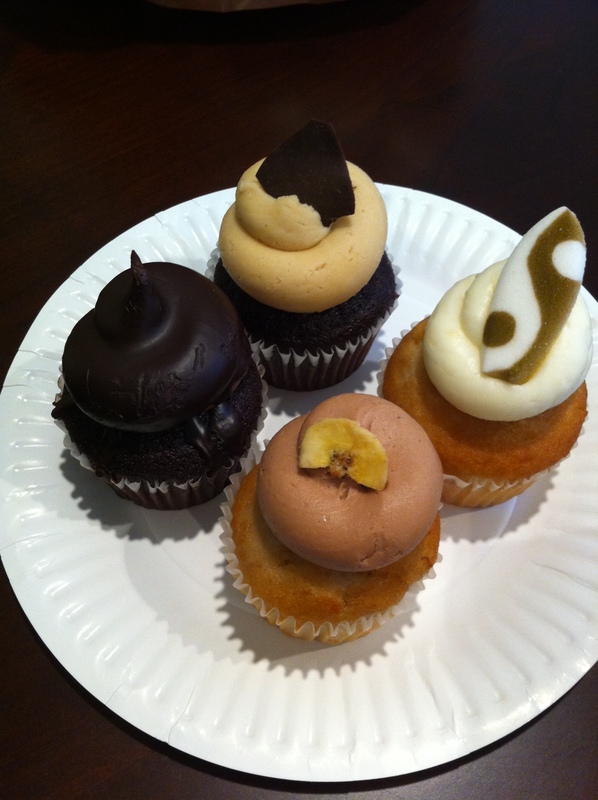 Below is a picture of the 4 flavors we got this last weekend going clockwise around the plate starting at the top: Peanut Butter Cup, Big Kahuna (limited flavor), Monkey Tail (monthly flavor) & Chocolate Fountain. My friend and I cut them up so we could try a little bit of everything and not feel too guilty about eating so many, but really it is a cupcake how can you feel guilty eating a cupcake? First up Peanut Butter cup; chocolate cake topped with peanut butter buttercream. The star of this cupcake was definitely the peanut butter buttercream, it was like eating whipped up peanut butter, it had this deep rich peanut butter flavor that was just perfect. But when it came to the chocolate cake they lost me, it was dry and lacked any deep chocolate flavor. I really like in my chocolate cake to be moist and full of chocolate flavor and theirs really didn’t hit that bar, so for me it was all about the frosting. I ended up just eating the frosting from my section because it really was that good. Next up the Big Kahuna; coconut cake topped with pineapple buttercream & decorated with a sugar surf board. The coconut cake was perfectly moist and had a nice texture with just the right amount of coconut flavoring. The pineapple buttercream was a bit on the sweet side for me, but it paired nicely flavor wise with the coconut. Next we have Monkey Tail; banana cake topped with nutella buttercream & decorated with a banana chip. Out of all the flavors we tried this one was my favorite. The banana cake was baked perfectly so it was perfectly moist, had a delicate crumb and a balanced banana flavor. It reminded me of banana bread but a lot less dense. The nutella buttercream on the other hand needed more nutella flavor, it to me just tasted like buttercream frosting. But despite the lack of nutella flavor it still paired very well with the banana cake so that does make up for it. Last up the Chocolate Fountain; chocolate cake, topped with chocolate buttercream & then dipped in chocolate ganache. I was truly looking forward to this cupcake all week and I have to admit I was let down. I was expecting this chocolate explosion upon first bite, but honestly for me it was just blah. The chocolate cake again was dry and lacked chocolate flavor, and the buttercream to me had an odd taste; I want to say almost acidic, like it needed more sugar because there was non-sweetened chocolate in the base. Then the chocolate ganache was a nice touch but it got lost in the buttercream for me and I couldn’t really taste it. Despite the few misses here and there this is still a top notch bakery and I wouldn’t let them deter you from trying them. Because they carry such a wide range of flavors, there are a lot of options and it may just take a couple trips to figure out your favorites. From a previous trip there I would recommend getting the Milk & Cookies and the Coffee & Donut flavors a shot, these were both very good and were baked perfectly.